Today I went to Play It Again Sports in Iowa City and sold my hockey gear, except for my skates (CCM) which still fit. I haven’t played for about 6 years. Usta play lots. Played since I was 11. Played in Sapporo, Japan. Played in grad school. But I couldn’t play two dangerous sports at the same time, said someone very close to me–and someone smarter than me. So, I sold $500 worth of gear and got $30. Not bad. Does anybody have a similar story? Did I tell you the time I played hockey in Sapporo, Japan? Bottom of the barrel Jofa skates set me back $900. Ah, that is a story for another day. The point is. I started the sport of nordic skiing too late! And I have to make up for lost time. And one way to do so is by clearing out the garage and getting ready for more gear. That will make me faster in itself. What is it like to be a Pro Tour Bike racer? 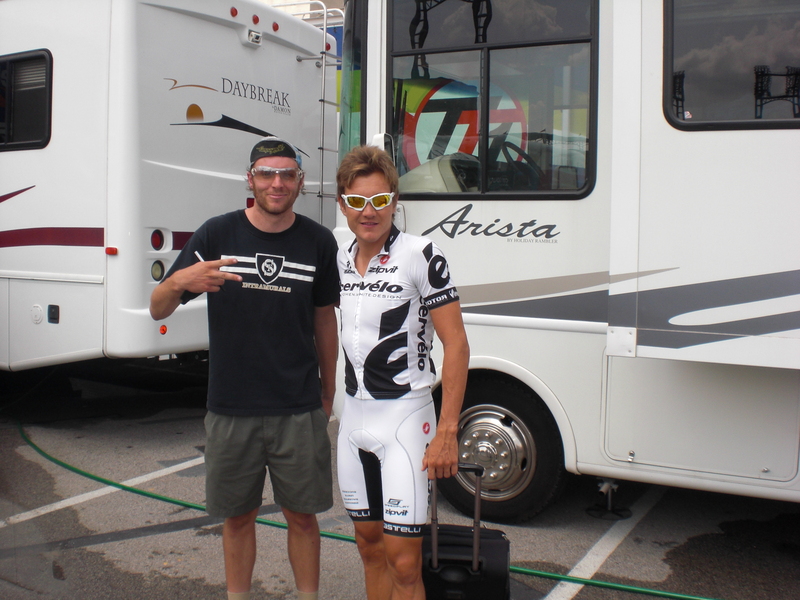 The guy on the left is not that slender, but the classics rider on the right… he looks too delicate. I mean, not that I could beat him in a race. I’m just saying. That’s right. I said mean. Wait. You think that Jens Voigt is nice? No, he isn’t. He is so mean that he beat up three grandmothers just after I snapped this picture. Jens may have a reputation as a misty-eyed poet-cyclist, but he is a ruthless killer, a two-wheeled speed freak that spits and swears. I know that he looks nice and calm in this picture, but he has been coached. Finn is my photogé–it’s like a photo-protegé–and he muscled his way through the crowds. Note that even through the scrum, Jens locks eyes on Finn–who is wearing the blue Campy hat and sporting the Glama-glasses. You may not be able to tell, but Jens is yelling at Finn, saying: “WHAT THE HELL YOU LOOKIN’ AT FLATLANDER?” I can’t repeat [even in a blog] some of the other things he said. We wanted to get a pic of another Saxo Bank rider, Jason McCartney, but he was running late and sprinted out of the bus, onto his bike, and was gone–but not before he gave us an Iowa City Wussup nod. Yeah, we know big-time cyclists! sooner than my last break. Several readers have asked the Street Theorist about pics and vids. All the questions were the same: How in the hell do you get such unbelievable shots? Without fooling anybody, I think that it is safe to say that I posses above average image-tracking capabilities. Besides my footwork and my stamina, I think a lot of my talent has to do with my equipment and my full understanding of my gear (I am a gearhead after all). Well, here is my camera. It is digital, of course—“bien sur” as they say in Canada! Can you believe I picked up this hi-tech rig in a bargain bin outside of Wolf Camera…with warranty (some clerk must have placed it there by accident). And here is my video camera. I know it looks bulky, but it is deceptively lightweight and portable (probably because of all the stealth carbon). As much as I love the HM, I think I am ready to step it up a notch. What I want is the new Samson Zoom Q3 Videocam. If Zoom wants to sponsor this blog, then they should contact me quickly (I heard the Jonas Brothers Cutiepix line is about to hit the shelves). But this is really about racing, not photographing. Let’s get one thing straight, I am a racer and today, I am racing. I warmed up on my trainer for a solid 30 minutes. Got the blood and sweat going pretty good. Then I pinned on the number and pedaled to the course. The men’s 40+ 50+ were still out on the course with one lap to go. I watched them strain by. When I heard that the race was over, I got onto the course, rode around corner four, and there, right on the corner, I saw two riders not only crashed, but still laying on top of a large rock (why is there a rock right there?). Almost like they were posing on the rock with painful smiles! They were moving, but scraped up for sure. Nice to see this as I roll up to the line. When I get to the line I notice more chaos that usual. It seems a rider is down near the finish line. Everybody is squeezed to the side of the course to let emergency vehicles through. Very quiet. I see an All-Nine-Yards rider and talk to him. Steve is an Iowan too, so of course we bond. He asks me if I saw what happened. No, I say. Then he drops the bomb: “do you know Dominic Moraniec? He rides for Atlas Cycling (based out of Iowa City). Yes, I do know Dominic. Not personally, but I see him in all the regional races. Steve’s friend comes over in tears to tell us that his left shoulder is really banged up, but he is conscious. The ambulance leaves. And then, as crazy as this seems, the announcer calls my race to the line as if we are going to race even though we just saw what could come of racing! I wish Steve good luck and as the riders move forward, I move backward. The whistle blows and I look behind me: nobody. I am not only the last rider in the race of 110 riders, I am behind the last line. The caboose. Le lantern rouge. After a few laps, I decide to, uh, practice the corners on my own. My mental game was so dismantled, so thoroughly crushed, that I could not mix it up. It’s not like I quit. Instead, it is more like I said to myself: under no circumstances can you pull out of the race and under no circumstances can you go down. So, in order to keep it rubber side up, I just twiddled at the back. Now the back is not the best place to be if you want to finish a crit. Into each corner: brake hard. Out of each corner: sprint like the dickens. After 12 minutes of that, I was clobbered. So, I drifted off 6 feet, then 10 feet, then the elastic snaps. I decided to work on my cornering skills until the refs pulled me…but they don’t pull me. After I figure that I have had enough corner practice, I hit the showers. I accomplished my goals: entered the race; no crashes. Called my buddy Dwight and we had dinner at the Slowest Restaurant In The World: Mama Campisi’s-On The Hill. Good food, great location, but it did take us a million and a half years to get served. The food arrived in the middle of the men’s pro-1-2 race. The good thing about our location was that it was not on the finishing straight so we could not hear the crashes and we could not hear the booming announcer. Just the hum of the wheels zipping by. By the time the race ended, it was completely dark, the street lights were on, and Dwight and I had finished our food and wine. It was a quiet end to a rough day for many racers. 1. Today, September 15, I talked to Dominic. He is now in the Burlington (Iowa) Hospital. Although his life was never in too much danger, he did lose a lot of blood right after the crash, and his left shoulder is going to take multiple surgeries to fix the broken bones (humerus, scapula) and reattach the muscles—and perhaps a year of rehab. I wish him a speedy recovery. I hope to see him at Jingle Cross in Iowa City in November—not on a bike though! 2. I met Adam Fuson, who is a racer from Cincinatti. He provided me with some fine bike racing philosophy. We were talking between races and I said that it was a miracle that more racers don’t crash in each race. He said, “no, that is completely the wrong way to think of crashing.” My summary of his crash philosophy: If you multiply the number of racers by the number of laps and the number of corners, you can actually see that most of the time nobody crashes. Even though racers could crash, they don’t always crash. Out of all the riders and possible places to crash, there are really very few crashes. Therefore, you should not focus on the few crashes at all, but on the moments of racing in which everything is going just fine. Crashing is an anomaly, a break in the smooth peacefulness of the criterium (okay this last sentence is all mine). He is right. If I focus on the crashes, then I won’t ever race. If I focus on racing, then I might get faster. 3. When church got out at the quaint church right next to the finish line, the attendees got toasted ravs, beer, and then sat down at all the tables on the church patio and watched the race. How civilized. I took some fine pics, but closed my cell phone before saving them. I was using my HM camera up to this morning, but it ran out of battery juice. 4. Four riders from Liquigas were there to sign autographs and rub shoulders with all the Italian community in the St. Louis Hills neighborhood. I got sweet pics of Franco Pellizoti! But, again, I closed my cell phone before I saved the shots. Doh! 5. Notice that I did not mention any race results. It was one of those days in which I was not into results. 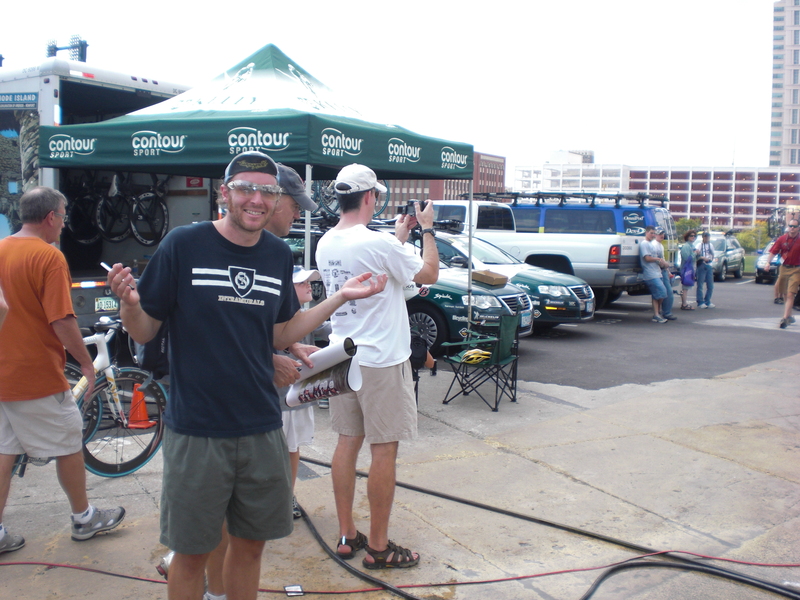 Anyway, check out www.gatewaycup.com if your really need that kind of stuff. Stay Tuned for Part IV: Tour of Missouri; Or, How Not To Get An Autograph! I was lucky enough to get an answer to the question posed in yesterday’s post. It was a question about a certain Marco Pantani finish in the Giro d’Italia. My stars must have been lined up because the answer was from Matt Rendell: the same Matt Rendell who wrote the book that I am sure goes into depth on that stage win: The Death of Marco Pantani: A Biography. The answer is at the end of my previous post. Olympic Gangster: The Legend of Jose Beyaert – Cycling Champion, Fortune Hunter and Outlaw. Matt Rendell (Mainstream 2009–this just came out in July!). The Death of Marco Pantani: A Biography. Matt Rendell (Phoenix 2007)–see pic above. A Significant Other: Riding the Centenary Tour de France with Lance Armstrong. Matt Rendell (Phoenix 2004). The Official Tour de France Centennial 1903-2003. Edited by Matt Rendell and Nicolas Cheetham (Weidenfeld and Nicholson 2004). Kings of the Mountains: How Colombia’s Cycling Heroes Changed Their Nation’s History. Matt Rendell (Aurum Press 2003). On to the race report for the 2009 Gateway Cup. Let’s start at the end. Click here for the results of the entire Gateway Cup. But even with this information, you keep reading. Why? Because it is the story that we want. We want information, details, and fleeting glimpses into the feeling of racing… a feeling that often boils down to degrees of pain. My friend Finn gave me this apt quote today: Pain is just the feeling of weakness leaving the body. Dunno who said this. Will track it down soon. Let’s pick up one story then. Mine. I arrived late into St. Louis after a rain-soaked drive down 61 from Iowa City, Iowa, on Saturday, September 5, 2009. I thought that I had missed all the races, but luckily, the men’s pro-1-2 race started a bit late: I saw most of the race. This race was the “St. Louis Hills” stage in the Gateway Cup, the third stage. Even though each of the four races was a criterium, it was still a race that tracked each race and presented leaders’ jerseys for the rider with the lowest accumulated time (in the women’s and men’s pro-1-2 category; I am not sure if they had leaders’s jerseys for the other categories). OBSERVATION #1: The course was a 1.3 mile, extremely wide and smoothly surfaced rectangle around Lafayette Park. Flat corners and only a moderate hill—more of a steady incline—running through the start/finish to corner #1. This short vid of corner number 4 gives you a feel for the wide open course. The course is not perfect though. There were crashes (I didn’t see any but I did hear about them), and the hill wasn’t steep enough to cause real selections. OBSERVATION #2: Great vibe! Everybody was friendly, from the racers to the crowds and even the announcer was nice. Wait, those guys are always nice. Why was the vibe so sweet? My best guess is that there are very relaxed open-container laws in St. Louis. For example, you could walk up to a host of tents along the course and get a selection of wine and beer. My favorite was the Bertolini’s tent which sold yummy toasted ravioli with grated parmesan cheese and marinara sauce. These snacks and sips were quite a civilized way to watch a bike race (hey Iowa, are you listening?). OBSERVATION #3: The pro-1-2 field was alarmingly big. How many? 124. But when they are flying at you at 35 mph, it looks like 190 riders. OBSERVATION #4: Noticed that my friend Brett was riding the tail-end race moto. It looked like a nicer gig than riding the lead moto because when a rider popped off the back, he could chat with him for a few seconds. Brett said that he has been in over 50 races this year as official moto. Way to go Brett! Hi Bart! Yes, my camera skills have not caught up with my writing skills. OBSERVATION #5: Saw one of my teammates in the race! Duane Dickey. Well, he is not actually my teammate. We wear similar kits (Iowa City Cycling Club), but he is pro and I am a cat. 6 rider. Anyway the important thing was that he was REPRESENTING for the Iowa City Cycling Club (Go Smurfs!). The problem was, he was riding near the back, so I yelled encouraging words to him: “Hey Dewey, move up for love of God!” I think he listened because a couple of laps later he moved all the way up to the lead of the pack. Stupendous! Maybe I should become a cycling coach. OBSERVATION #6: “Big Shark” is the name of a fantastic bike shop in St. Louis and they sponsor a decent bike team. In fact there were about 59 Big Shark riders in each race. No, that’s not accurate, but you get my point. They were stacking it. Dan Schmatz was their leader as he had won the previous night and was in the leader’s orange jersey. OBSERVATION #7: Also saw Clark Priebe who rides for Sioux City Velo/Powerade. I like this rider as he put on a great show in the Iowa Criterium Championships where he got third. I think he is 44, and I like to see fast guys over 40 sticking it to the young punks. More on the topic of young punks later. THE FINISH: With five laps to go a small break formed and finally, the race got exciting. A group of 5 pinched off the front. In one lap they got 8 seconds: Duane Dickey, Keith Harper, Jeff Hartman, and Brian Jensen. Because Keith and Jeff are Big Shark, their teammates got the front and put on the brakes. Brian Jensen is a formidable racer and I have seen him crush the entire field at the Iowa City Criterium before (2008), so, I was worried for Duane (who, as you might remember, got to the front because of my encouragement). This group held about 8 seconds going into the final lap. I predicted that Brian would win. The announcer predicted that Brian would win. The crowd knows that this five-rider group will stay away. The course is too easy and too many Big Sharks are controlling the pack. Sewn up! Duane leads through corner 4 with three to go. Duane leads up the hill, couple to go. But today held some surprises for sports fans all over the Midwest. For example, Northern Iowa University played the University of Iowa Hawkeyes in Iowa City today. The Hawkeyes were predicted to blow UNI out of the corn fields. But the UNI offense turned the defensive line of the Hawks into baby chick Hawklets. With only 25 seconds left in the game, the Hawkeyes were leading by 1 point and the UNI Panthers had the ball on the Hawk 30 yard line. The Panther kicker was reliable and it really looked as if the Panthers were going to win. A 40 yard attempt was well within the kicker’s range. But for the first time in years, the Hawks blocked a field goal! Iowa was celebrating and going crazy. But then the whistle blew and a Panther had recovered the blocked football. In fact, the ball was blocked before the line of scrimmage, and so, and so, that meant that the Panthers had the ball and there was 1 (one!) second left. And they had another down left. Egads! This kick is the same distance. Surely the Hawks would not be able to block another kick, will they? But they do block the second kick. The Hawks do win by one point. Hard to believe. I like the Hawks, but I also like an underdog. I was hard-pressed to choose which way I wanted that game to turn out. And so it is in a similar vein that my own prediction of Brian Jensen stomping the gizzards of the other four riders does not come to pass. The pack catches the lead five and the sprint turns crazy, pell-mell, raucous, dangerous, cacaphonous. The lunge for the line! It may be the Worst Sports Pic of the Year. I will enter it into that contest next week. But wait a sec. Do you notice that an orange jersey is visible on the right side? Hmmmm! Well, that is Dan Schmatz! And he won the race. Ha. So my pic is not too awful. And do you notice a black and white kit near him? Cole House=#2. As I learned a bit later, the finish was not as close as I imagined. Here is what went down from three different perspectives. Brett: Brett was behind the race and saw the pack catch the five leaders on the backside of the course. He had just talked to Duane and asked him what happened. Duane said: “things looked good and then everybody started dicking around on the backside, and that was it.” (I realize some of this language might be a bit rough, but I ask for your patience, these are athletes under duress.). Todd Campbell: When I walked by Todd, I did not know him, but he looked fairly pleased with his race and so I collared him like the aggressive journalist that I am. Todd races with Epic Bikes out of Kansas City. He said that he came in around 30th (a bit further back actually) and that it was a fine finish for him. He said that the last three corners made the entire race. He was well back with one lap to go, and then two things happened. First, he took some chances on the pancake flat corners and advanced a bunch of places with each corner. And second, the Sharks were getting tired at the front and they couldn’t contain the pack. The guys at the front were “blowing up right and left,” which made it easy to advance as along as you caught a kind wheel moving up instead of back. If you squint, you can see Chad, Cole, and Dan leaving the podium. And I did not see Steve up there kissing the girls. Todd thought for a moment. “Perhaps he is contesting the finish.” How about that for some intrigue! [It turns out that Steve was fourth]. Todd was very nice for talking with me, and I hope he does well in the upcoming races. Cole House (BMC U23) and Chad Hartley (Gear Grinder): Although they are on different teams, they travelled down from Wisconsin together, and they seem to be friends of some sort. Or, enemies that get along really well. Cole was second and Chad was third. It is hard to duplicate the ribbing that went on during the interview. While they would talk they would take turns interjecting a comment, usually a one word quip. Their favorite word, hands down, was “sketchy.” This term was liberally applied to riding, riders, ability, and everything else. They might have a future as a comedy team if the biking thing does not work out. But unless all of their legs suddenly were to fall off, that ain’t gonna happen. These guys have an excellent future ahead of them. In order to duplicate their cross-court verbal style, I have inserted their inserted words using parentheses. Me: So, Cole, how [Chad: sketchy] did the final lap play out? Cole: I saw it coming together as Big Shark [Chad: sketchy] were losing their lead guys and I also knew that I had [sketchy] to be near Dan’s [sketchy] wheel (Schmatz) because everybody was sure he would get the lead out for the sprint. I finally got to his wheel at the third corner, but then I lost it [Chad: naturally]. Then on the final stretch, I gained a few places but I could still see two riders in front of me. Dan and Chad. I was pretty lucky to just beat Chad at the line. Me: So Chad, it seems that you launched early. Tell me about your finish [Cole: sketchy]. Chad: I had to go early today because yesterday I went too late. [note: yesterday, Cole was fourth and Chad was sixth]. When the catch was made on the backside I went [Cole: nnggguuh]. Caught and passed the remnants of the break and put my head down [Cole: sketch]. As I rounded the last corner I thought I might get it, but it was a long, long way to the finish. Slightly uphill. Jim Stemper (13th), Chad Hartley (3rd), Cole House (2), Rob White (25th): Remember these names! I drove off feeling positively amped with excitement. I went to bed early because a big day of race lay ahead. And possibly, just possibly I might even enter a criterium. Drum roll please……my first crit in 4 (four!) years. STAY TUNED TO THIS BLOG FOR THE NEXT INSTALLMENT: PART III; OR WHY IS THIS NUMBER PINNED TO MY JERSEY AND WHO ARE ALL THESE RIDERS TRYING TO KILL ME? My goal is to write up a series of reports from this past weekend in which I watched a great deal of bike racing: The Gateway Cup and the first day of the Tour of Missouri. As with my Birkie Report, the aim is to grapple with the feel of the racing, rather than the clinical facts of who won. So Scraps, why do we race? After the Pro-1-2’s race, day three of the four-day Gateway Cup, I saw something that I believe will go far in answering this question. After the podium girls left the area, after the officials had posted results, only a few riders were around talking with friends and family, and I noticed that the course was still closed to traffic still. The street crews were probably tackling the back side of the course first. I also noticed that two girls were riding their bikes near the finish line. They were about 9 or 10 and I watched them for a few seconds and noticed that they were highly skilled riders. I walked to the barricades and watched them ride back and forth. Riding their 20” girl bmx bikes (Raleigh Cup Cake perhaps), they exhibited riding skills that informed me that the universe was not a bad place after all. I think that they were showing off for a lucky parent somewhere, or maybe just to practice their moves. First they would gain some speed with a few smart pedal strokes, then they would take their feet off the pedals and make circles in the air with their feet. The next pass, they kneeled on their seats. On the next pass, they crouched, feet on the seat. As I said: highly skilled. When they tried to stand up on their seats, I could hear a fatherly voice call to them: “girls!” And they would sit down obediently. But the next few passes were even more astounding. They would pedal a few strokes to gain momentum and then let go of the bars, arms outstretched wide, hands open, head tilted slightly back, and here is the kicker: their eyes were closed. And thusly, they would glide across the finish line, coasting. It seemed to me that these girls had reached a state of grace in their biking. More than that (and what could be better than grace? ), more than that, they were demonstrating what glory looks like. Not the glory of winning, but the glory of crossing the line—even when there is no race. Why do we race? We race for moments of glory and grace…just like these two girls. Sure, you may say that you race for money, for fitness, for your ego. True, true, and true. But you would be wrong in a larger, more theoretical sense. Remember, life is both real and theoretical at the same time. Example? Electricity and gravity are real, but you cannot see them. We create theoretical models of how they work, and for anybody who has fallen down, gravity sure does work. We negotiate the physical world and the world of ideas as they combine and tangle. So, as I write about this race-packed weekend in St. Louis, keep this image in mind. This guy below may know what this feels like more than most. Cav won the first stage of the Tour of Missouri, but he did not have his eyes closed. But I am getting ahead of myself. I think that Pantani has something to offer us as we investigate the idea of grace and glory. But surely was not on the mind of the young girls (unless their mom or dad is a cycling fanatic who continually watches 1997-1999 grand tour dvds). Yet I was struck by the similarity of the cool pose. Can someone tell me the year and the stage that Pantani won here? Clearly it is the Giro. I might even read Matt Rendell’s book about Pantani to see if I can learn something. Worth a try. Bike riders and bike racers know so much about biking. But we don’t know it all. Sometimes we don’t know very much. Wassup Readers!….no. that doesn’t sound right. Hello fellow streeters!…no. Too smarmy. Sorry for the long silence!…yes, now that is getting more to the point. So why the big hiatus? Vacation for one. Job issues for two. And career issues for three. I realize that job and career are similar, but there is a difference worth theorizing. You see, a job is something that you do for money, while a career is a job that you do for more money. Got it? Now, my friends I don’t want to whine. So I won’t. But for a while I was under-utilized by the great academic machinery of this nation. I decided to take matters into my own hands. And behold. I am now, once again, an entrepeneur! This is my new logo for my new endeavor. We went online yesterday. Tomorrow is my first day at the office. Yes, I am worried about what to wear, but I will manage the big day with or without my wordsmithing vest. My pocket protector? I cannot do without my pocket protector. What is Iowa City Wordsmiths? We offer writing, editing, proofreading, and tutoring services in Iowa City, Iowa– and around the world. Check it out for yourself at my brand new website designed with grace and style by Brown Wing Studio.